I am writing this on Friday with a real buzz despite feeling fatigued. What a night, a real pleasure. As the weather forecast was for a bright evening with cloud later, I left work slightly earlier and hurried home to observe the crescent moon. It was a real beauty. The narrow 4-day old crescent hung over the bare trees, the dark side lit by Earthshine. Mare Crisum looked stunning with towering ramparts falling onto the dark lava-filled basin floor like sugar cubes on black velvet. I was joined by my neighbours family whose son had a telescope, a lovely 4.5″ tabletop dobsonian. We soon had it up and running and I showed him to swap eyepieces, focus, align the finder before looking at the moon, Pleiades and Orion Nebula. This little telescope has quite a punch and is ideal for a young observer. It is easy to carry in and out and not too expensive. Something I will look at getting my children if they show an active interest in Astronomy. At about 8ish, it was time for his bed and I packed up before getting my dinner. By 9-ish a layer of thin cloud moved on so I started going through my earlier pictures while watching some youtube videos. I happened to look through the window as I was clearing up to see a bright Jupiter looking back at me. I rushed back outside and it was beautifully clear. The clouds had departed leaving a layer of star crystals above a black (if somewhat light polluted grey-orange) sky. I hurriedly set up the Mak, put on my warm layers and grabbed the laptop. 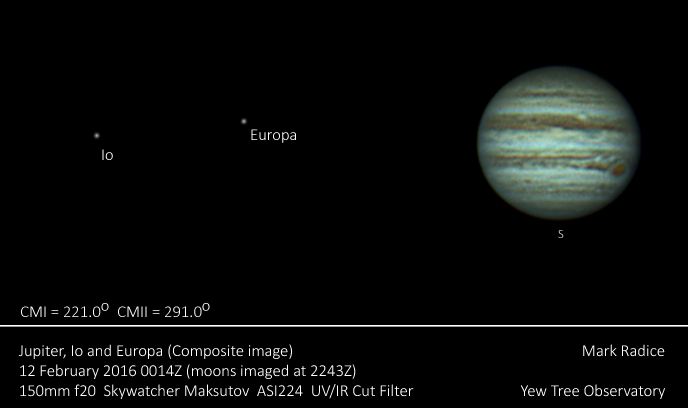 It wasn’t long before I had Jupiter on the camera chip with the Great Red Spot taking central stage. The great thing about Jupiter is that it is so dynamic. In only a few minutes, the cloud storms are noticeably carried by Jupiter’s rotation. Jupiter’s 4 moons are equally exciting as the swoop back and forth in their orbits. It is never the same view twice. I had been hoping to make a timelapse of Jupiter’s rotation for sometime and, as the seeing seemed to be quite good for my location, I set the camera to take a 2 minute video every 5 minutes. Some 2 hours later I was still there, shivering away under the cold sky. The GRS had rotated away and I was looking forward to Europa and then Io’s shadow transit at 0200. I could not help thinking, though, that I had work in a few hours. I reluctantly packed up at 0100. I wantied to push on through and enjoy watching the largest planet in the solar system before catching Mars and Saturn before dawn. I knew packing up was the right choice but I was disappointed to be missing clear skies. I was in bed at 0130 before the alarm went off very painfully at 0630.The poor laptop is now straining from processing all the gigabytes of data and will be exhausted by the time I have finished. Here is the best still and a link to a youtube video – best watched in the smaller size rather than full screen.